As for where to invest, Fred Tomczyk thinks U.S. equities are still the way to go. TD Ameritrade CEO Fred Tomczyk. 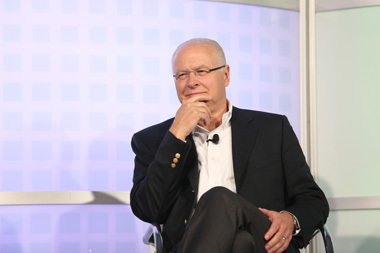 Following up on the opening-day speech by TD Ameritrade Institutional’s Tom Nally, company CEO Fred Tomczyk took the stage in San Diego Thursday morning for a “fireside chat” with CNBC’s Mandy Drury. Tomczyk mentioned that TD Ameritrade (AMTD) had another fine year in 2014, as measured by continuous double-digit growth in assets ($52 billion) and a 50% growth in futures trading, and that the company was well positioned for further growth if interest rates increase this year, as most expect. He admitted that volatility has returned to the markets, but Tomczyk said he wasn’t surprised, since he expected the markets to be “choppy as central banks unwind” their monetary easing policies. As for oil prices, Tomczyk said it’s “not obvious that we’ve hit bottom,” and while he said it’s “hard to see oil rising short term,” he does expect a price recovery in the longer term. When asked by Drury what “keeps you up at night,” Tomczyk replied with three separate issues: technology, cybersecurity and fixed income. “There are technology trends that are long term and disruptive,” he said, including big data and social media, which are “reshaping the ways that all businesses,” including his own and advisors’, produce and market their products and services. Tomczyk characterized the cybersecurity threat as similar to the Middle East, where there is “continual fighting,” and warned that the worst outcome is when a hacker secretly enters a computer system without the system owner’s knowledge. On fixed income, Tomczyk said that unlike the efficient and liquid equities markets, bonds remain “nontransparent” and are in need of reform. He then considered reform in general. “More disclosure isn’t the answer,” since it hasn’t worked in the past, he said, “unless it’s done in a simple way” that’s understandable to investors. — Check out RIAs Rarin’ to Compete in 2015: TDAI Survey on ThinkAdvisor.